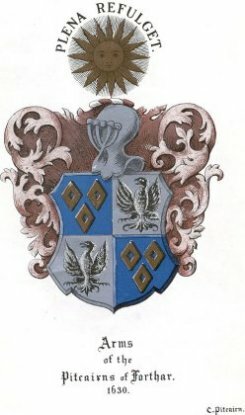 Barbara, David Pitcairn of Forthar’s fourth daughter, married Sir William Murray of Letterbannachty, and was the ancestress of the great Lord Mansfield, Lord Chief Justice of England. Her husband was descended from Sir William Murray of Tullibardine, who died about the year 1511. Edinburgh, 1st November 1573, William Murray and Barbara Pitcairn bought back Pitcairns, Perthshire fro Lord Ruthven and in 1580, 14th January, they had a charter of South Kinkell in Perthshire. Sir William had two sons and three daughters. 1 married to Balcanquhal of Balcanquhal. 2. Bethia, to Sir William Murray of Ochtertyre and 3. to Kinross of Cambusnethan in Strathearn.